So since we’ve long confirmed that JJ will be tackling Star Trek 2, and then confirmed it again just for the hell of it, it’s time for the anticipation machine to start charging its warp core. 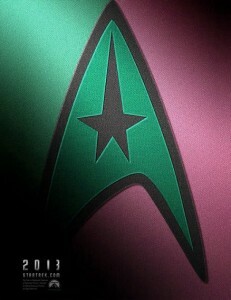 The studio will certainly be eager to see the unexpectedly huge level of response to the first film start sizzling again, and they’ll be stoking it among the core fans with a line of Star Trek comics that will not only be planting the new crew into stories from the original series, but will be a larger story that increasingly deviates from the original timeline and ultimately seques into the new film. …in the way that the “Countdown” series set up backstory for the last movie. It’s fantastic to have Bob’s input, because he can steer us clear of story elements that might conflict with what’s coming up in the next movie, and we can lay in subtle clues to what’s coming up so that once you see the new movie you can go back and see how it evolved in the comics. What other episodes will you tackle, and what excites you most about your fresh takes on those episodes? Johnson: Each episode will be told in two issues, so in issue #3 and #4 we will revisit the events of “The Galileo Seven.” I’m excited about this one because it’s a Spock-centric story that explores his brief experience as a commanding officer and how he was affected by losing command of the Enterprise to Kirk in the last movie. I can’t spoil which episodes come after that, but I can say that events will deviate more and more from the TOS versions as the new timeline evolves. There is the suggestion that the comics may end up being the place to be introduced to new characters that will show up in the film, so again, this will be your place to get a canon Star Trek fill during the long wait for the new movie.